The solid surface from PORCELANOSA Group, KRION®, acts for all purposes in any sector in which it is used; but its additive-free antibacterial, easy cleaning and ultra-white properties make it ideal for use in kitchens and private homes. 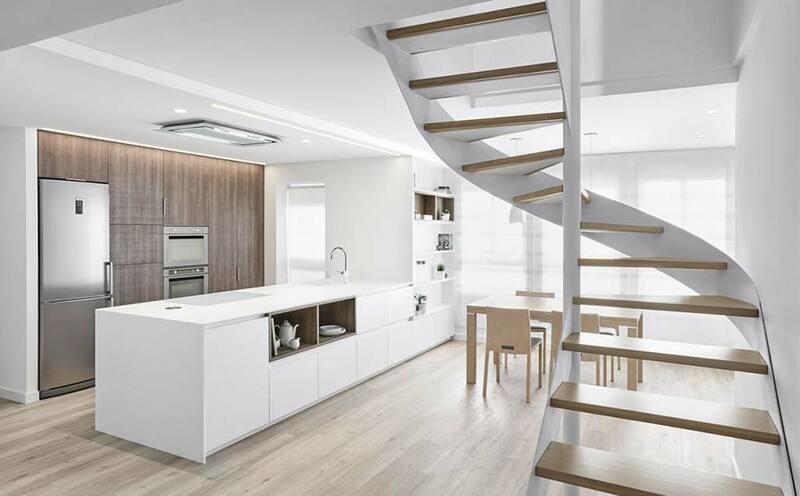 In the home created in the city of Valencia, the Aurea Arquitectos studio designed a spacious kitchen created with KRION®, with an aseptic, sculptural appearance, thanks to the photogenic staircase and combination of KRION® 1100 Snow White and natural wood that never disappoints. Aurea Arquitectos is an Architecture and Urban Development firm, with professional headquarters in Toledo and Silla (Valencia), led by Lorenzo Gimeno Soto, and Gema and Yolanda Cerdeño Gómez. Its services include the design of project, management of works, and consulting. KRION® transformed by InduTec Solid S.L.